If you were to show this picture to the nurses in our hospital they would accuse you of photoshopping it. It couldn't be that the child that screeched and screamed daily at each bath time, the one that could be heard from outside the department, the one that would refuse eye contact and to talk for 15 minutes after could be smiling while bathing. Let me assure you this picture has not been tampered with whatsoever. 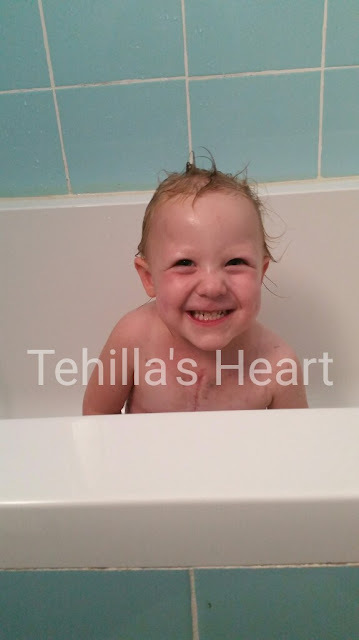 That is in fact, Tehilla smiling while bathing. It took a lot to coax Tehilla into the bath. I left the water running on a very low pressure. Then I told her not to dare stick her foot in it. Well, that's all it took. One foot in. The second foot. A splash. A little more splashing. A little scrub here and there and then much more splashing. Yes, I was drenched, as was everything else in the room. Yes, we might be responsible for a water shortage in Israel. But Tehilla was laughing and enjoying and completely forgetting to fear bath time. Thank You, G-d, for continuously helping Tehilla to heal from her physical and psychological wounds. Another big recovery step! Shalom Tehilla, I feel your joy sweetheart. Continue to be happy and I wish your complethe healing and hapinness! HaShem loves you! Baruch hu! Baruch HaShem .I can see the joy you fell and am pleased you are healing so quickly. No doubt you will heal completely. He loves you so much. To Him be the Glory!